Much of the company search process is about failure; deals will fall apart, and the more you understand why, the better prepared you will be to recognize the warning signs, anticipate them, and even avoid them. Remember that your most scarce and valuable resource during the 2-year search is your own time. As described in the Getting to Closing blog post, it takes an average of 3.2 LOI’s to get to a closing. You will want the 2.1 failures to happen early in your search to develop the “reps” that build your expertise. When a deal falls apart, view it as an opportunity to improve your processes. Learning from your own mistakes, and from others who have seen their deals fall apart, gives you credibility with the seller, their advisors, financial institutions and your investors. With each successive “rep”, the seller’s perception that you are a qualified buyer will grow, even though this is your first, and perhaps only, purchase. Just because you have a signed LOI in hand, with the negotiated terms spelled out in advance, don’t be fooled into believing that the seller has fully absorbed the impact of their selling their business to you. In many instances, the signed document gives them opportunity to reflect on what their lives will be like after they leave the business. They may not be “fully committed” to selling and simply withdraw as the process moves forward. However, positive signs would be them telling their employees about you, introducing you to customers, involving you in key decisions and including you in key personnel changes. 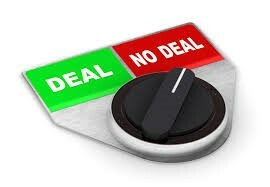 There are many other reasons why a deal can crater after the LOI is signed. There may be shareholders or family members who disagree with the terms or the impact on them personally. Paul Thomson at Scottish American had a father and son who could just not agree. A Midwestern searcher had three brothers who constantly squabbled with each other after the LOI was signed and subsequently removed their business from the market. In a number of instances, brokers convinced the seller that there were better qualified buyers somewhere, wanting to “shop the deal” elsewhere to secure a higher price. “When [one] seller found out that they had to pay their broker even though I came direct, he stopped the deal”, said Paul Thomson. In another case, the sellers lawyer, who at age 85 was very familiar with the industry, repeatedly nudged the seller not to sell their business to someone outside the industry. Personal circumstances can cause a deal to end, as when one owner’s wife became terminally ill and he had to devote significant time to her care. In another, the deal process aggravated a health problem causing the owner to pull back from the process and delay for a year. When an employee sued another seller midway through the closing process, a protracted re-write of the legal documents led to “seller fatigue” and a reconsideration of what the “Representation and Warranties” really entailed. A lengthy diligence and closing process increases the likelihood of killing the deal. Take cues from your lenders about the depth of due diligence required, as they will probably want more than your investors. Rehmann Rayani of Mont Vista learned “You don’t need to turn over every last stone in a small acquisition – it’s very easy to spook a seller with too many meaningless requests.” You want to be having regular dialog with the seller, at least three times a week. Being watchful of how the seller is reacting during the due diligence process is very important. On searcher says, “The closing process is very hard, so the seller must be very enthusiastic about the deal from the beginning. Otherwise, there will be plenty of excuses for them to pull out along the way.” Remember, most sellers have not been through this process before, and you want to be sensitive to any changes in their mood. Your LOI assumed accurate financial statements. In some instances, the seller or the broker may have been “optimistic” about EBITDA, add backs, and income projections. You will want to establish metrics with the seller to monitor actual financial results during the closing process to immediately detect any drift in performance. Since the average closing time on a deal is about 5.1 months, you want to be surfacing any material performance fluctuations as they occur. It is best to create a simple spreadsheet of the most critical key performance indicators (KPIs), and capture new entries monthly. One searcher discovered a 25% revenue drop during the 30 days before closing, with the sellers claiming that this was simply the nature of their industry. He was unable to reconcile the decline to the previous 5 years, and the deal fell apart. In another case, the owner had failed to mention that she had recently made a 20% reduction in staff to cover increased expenses (while the searcher was raising funding and dealing with bankers). Adam Barker of New Forest found that “EBITDA was listed as double what our QoE (Quality of Earnings) accountants found. The broker had just been too creative about the add backs”. In another situation he found “The seller had concealed costs by running some of their costs through a separate entity, so we saw a very inflated picture of the business; we had wondered why the SG&A was so low and it had been too good to be true!”. You want to be mindful of the future. In one instance, the seller had recently lost bids on future business with automotive/truck customers that would not be reflected in financial statements for over a year. Charlie Burckmyer of Knob Hill Partners discovered that “A key vendor was planning to dis-intermediate the seller’s business and go directly to the customer themselves, and the seller was unaware.” It is best to review monthly performance with the seller in person, to keep abreast of any changes, while developing your knowledge of the company, and cementing your relationship with the seller. Don’t ignore the balance sheet, like one Midwestern searcher did, when an appraisal for the real estate came in $500K lower than estimated, causing them to pull the business from the market. Another discovered that the inventory of finished goods was made up of SKU’s that had not been sold for over 18 months, but carried at full value requiring a re-negotiation of the terms to reflect the obsolete inventory. Searchers who uncover serious issues during due diligence that could have been seen during the IOI and LOI negotiations stage learn valuable, albeit painful lessons. By waiting too long to investigate the market and industry, you could find yourself wasting valuable time during due diligence, instead of focusing on getting the deal closed before the seller changes their mind. While some of the situations itemized above could have been discovered before getting to the closing stage, raising the debt and securing the commitments for equity from investors can’t really happen until you have nailed down the terms and developed your own projections for the business. Researching lender’s appetites for your deal’s industry takes time, unless you can locate one with a strong specialization, as Sean O’Neil did at AltEquity when raising debt for a security monitoring business, and found a bank with deep knowledge of that market. Commitments from investors may be hard to count on as Charlie Bruckmeyer at Knob Hill discovered when “The primary equity provider had half their portfolio in pink sheets and a crash happened.” As with banks, investors may just not like the deal, or may feel that you’re paying too high of a multiple for the “only” business you will have in your portfolio. I was devastated when an experienced banker told me I was paying too much for the business, no matter how good I made the projections look in my spreadsheet. Even the seller, when they hear that you are taking out so much additional debt, may become skeptical of seeing too much leverage on their business and back away. As Ben Murray at New Forest learned, “This is best addressed by having a frank exploratory conversation up front about the fact that we would use debt and equity to buy the company”. Deals do fall apart, and many for good reason, despite searcher’s best efforts. Reach out to other searchers to learn their lessons (and surprises) during closing to become a more informed buyer. Get your “reps” up, take your lumps if necessary, and get your eventual deal done. 17- Raising money is easy or impossible; know when to move on!